Successfully Added DVB-T Digital TV Stick - Digital TV On Your Computer to your Shopping Cart. 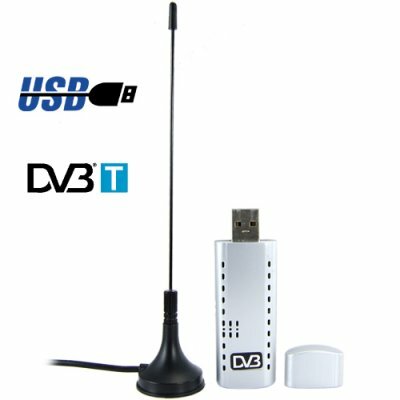 DVB-T USB Dongle for Desktop PC's, Notebooks or Netbooks - watch and record digital TV on your computer with this handy receiver and record the programs you like with DVR software. For roughly the price of a single DVD movie you can turn you computer into both a digital TV and a DVR. Twenty-second century entertainment at your fingertips! Similar to today's popular PVR's, computer TV viewing + recording software can auto detect your DVB-T region and automatically scan all available digital TV channels and adds them to your channel selection EPG. Now you can flip through channels just like you do at home. Then you can use recording software to record a program immediately with the press of a button or make use of the timeshift function and you've got yourself a modest TiVo alternative, but at a much better price (and without monthly fees!). This DVB-T dongle receives and encodes digital TV signals in MPEG-2 and MPEG-4 format for a quality picture everytime. Since you'll be using the dongle style receiver for your desktop PC, laptop, or netbook, all your favorite programs are saved directly to your hard drive for easy access anytime. This unit supports DVB-T MPEG-2 and MPEG-4 broadcasts. At first I had problems with drivers and software on Lenovo s10e running with XP, but then I installed this device on Dell Latitude laptop running Windows 7 64-bit. After plugging in the device, it installed drivers automatically and now everything is working without problems - using Windows Media Center, all channels were found and you can watch all available Free-To-Air channels. Included antenna is working great (even better than stationary one I have with TV), just make sure it is fixed to a metal base (otherwise some clutter can be present) or you can just use your own room or outside antenna. Amazing, easy to use and install, great value for money!! I have bought 3 of them, and even on my Atom 1.6 netbook it runs really nicely!! i ordered this piece 6 weeks ago to Thessaloniki Greece. Very good product. Works great with Digea Greece. (Mpeg-4 signal). You can also record any programm you like, into a five mpg file which quality is like a DVD's. Recommend it to anyone. Also great for my laptop, i can watch Digital TV anywhere i want to. And of course low price. Don't forget that. THANK you CHINAVASION once more.